If you Democrats are such great guys and gals, and have such wonderful ideas, and are so mainstream in your political vision you should easily beat a bunch of tiered old lying republicans. The Republican majority in both the state house and state senate were elected by the voters in from the districts gerrymandered by the previous democrat legislature. Both US Senators and our president were elected state wide so it doesn't matter how the districts were drawn. 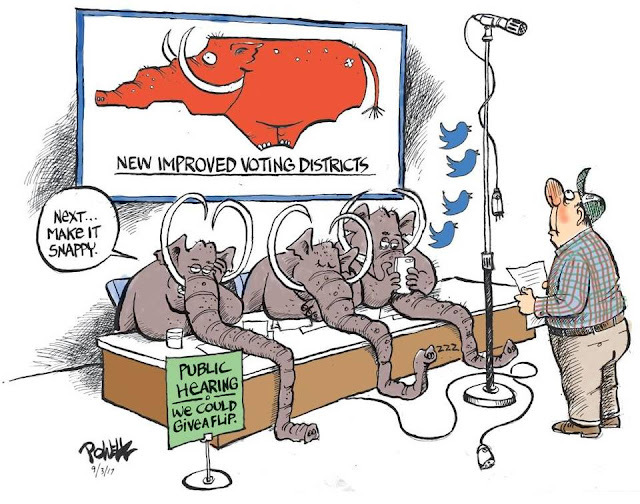 But, if it makes you feel better to blame your lack of voter support on the way the districts were drawn....go for it. BTW..how would you draw Jordan's district? ASU campus and Asheville? It hardly matters which of the contiguous counties are included, they, along with the permanent citizens iof Watauga, will offset the town of Boone voters. This is a PS. I forgot to mention the 2011 legislature which started all this mess. The only way to get a super majority was to totally and illegally prostitute the 2010 census and they did so very successfully. We now have a state government for the rich and completely paid for by the rich. That would be Art Pope, the John Locke minions, and the Koch Brothers. Ever notice how people like Art Pope and the Koch's inherited untold millions of $$$ and want us to live by their rules? Remember Lyndon Johnson discussing poor white folk: tell them they are better than another group and then you can pick their pockets all you want. Why Didn't You People Warn Me?